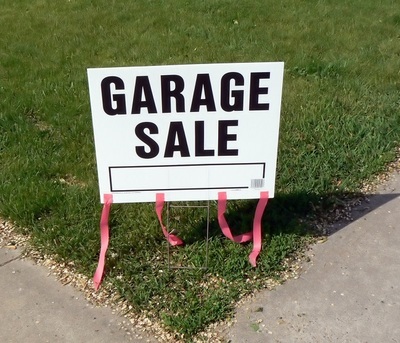 If you would like to make some money in a hurry, or simply want the clear out some unwanted items from your home, holding a garage sale is easy and needs little or no outlay. There are a few tricks you can employ to make yours a success. 1. Grab a few cardboard boxes (try your local shops – they often give them away), take a stroll around your house and look for things you no longer need or use. Some examples are old toys, baby furniture, clothing, shoes, handbags, ornaments, cooking utensils, books, CD’s, even magazines in good condition, anything that you can live without (and won’t regret parting with). 2. Take the time to clean the items up, wash toys, iron and fold clothes, etc. 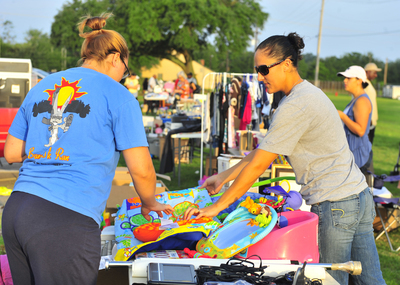 Box items into categories such as kitchen needs, kid’s clothes, adult clothes, bric-a-brac, and tools. 3. Decide on a date for your sale when you are confident that the weather will be in your favour, and whether you are going to pay for advertising. If you live in an area where you can attract plenty of passing traffic, you may decide that paid advertising isn't necessary. Make up a couple of notices and ask to have them displayed in local shop windows. Make up large signs with arrows pointing the way. An easy way to do this is to use a thick marker or paint on a large sheet of paper glued to both sides of a cardboard box. Use two bricks or rocks inside the box to anchor it down. Place them on corners where there will be plenty of passing traffic. 4. An easy and cheap idea for pricing items is masking tape. It’s easy to write on, cut and stick, and won’t leave a residue when it’s removed. 5. Don’t forget you’ll need a cash float with a mix of coins and notes. I suggest a minimum of twenty dollars and a maximum of fifty. Keep this in a safe place during the sale and don’t walk away from it. If you have a bum-bag or shoulder bag this is much safer. Also consider a supply of plastic shopping bags and some newspaper to wrap fragile items. 6. Remember when pricing items not to mark them too high. Be flexible. Let people know you are willing to negotiate. 7. On the day of your sale, get up nice and early. Use any tables, cupboards, card tables or even chairs that you have available as surfaces to display items. Planks between two chairs are ideal. If you don’t have enough table space, throw a tarp or blanket down and use that, although you may find that some people won’t look if they have to bend. 8. Remember to lock up the rest of your house. 9. When you are set up, put out your signs and tie some balloons to your letterbox. Greet people as they arrive but don’t make them feel they are being watched too closely. 10. Allow people to haggle. If business is a bit slow, try the ‘fill a bag for a dollar’ trick. This will save you carting it all back inside. 11. Consider asking a friend to share in this venture. Offer them a spot to sell some of their own bits and pieces. A second person can keep an eye on things when you have to nip off to answer the call of nature or grab a coffee. 12. Find a good spot to set up some chairs and have a pleasant day while making a bit of cash on the side!